William Hepburn Russell, William B. Waddell, and Alexander Majors, the Pony Express officially opened on April 3, 1860. The first trip, westbound, was made in 10 days, 7 hours, and 45 minutes. The eastbound trip was made in 11 days and 12 hours. Every 24 hours they covered approximately 250 miles. 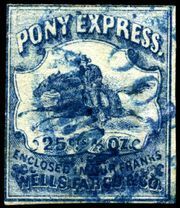 The Pony Express, established a year before the beginning of the American Civil War, reflected the need to provide fast and reliable communication with the West. In 1845, it took President James K. Polk six months to deliver a message to the Far West. Messages in those days had to travel around the tip of South America or across the isthmus of Panama. By 1860, the fastest route was the Butterfield Stage line from St. Louis, Missouri, through El Paso, Texas, which took 25 days. It was almost 600 miles (950 km) shorter to deliver the mail over a central or northern route. There were concerns, however, whether these alternatives were viable during the winter snows. In 1854, Benjamin Franklin Ficklin, an employee of the firm of Russell, Majors and Waddell, is said to have first proposed a faster northern route to California. Senator William M. Gwin. Russell, Majors and Waddell, headquartered in Lexington, Missouri (the hometown of Russell and Waddell), was one of the biggest outfitters for travelers on the Santa Fe and Oregon trails. The firm operated a vast complex in the West Bottoms of Kansas City, Missouri, and also outfitted the army from its western base at Fort Leavenworth, Kansas. In October 1857, Russell, Majors and Waddell faced financial ruin when Lot Smith and his Nauvoo Legion destroyed 54 of their wagons during the Utah War. The Army did not reimburse the firm, and the company began looking for other avenues for funds. In 1859, they bought from Ben Holladay the contract to deliver mail between Leavenworth and Salt Lake City, Utah. On January 27, 1860, William Hepburn Russell wired the firm from Leavenworth that Gwin was supporting a contract for California service on the central route provided that it be delivered in 10 days and be ready to debut by April. They renamed their Leavenworth & Pikes Peak Express to the Central Overland California and Pikes Peak Express Company to attempt the feat. The Hannibal & St. Joseph Railroad had just opened in 1859 and was the first railroad to cross Missouri. It was 30 miles (48 km) up the Missouri River from Leavenworth in St. Joseph. It was determined that this would be the starting point for a rapid central mail route to California. Alexander Majors and Ficklin assembled 190 relay stations over 1,966 miles (3,106 km) from St. Joseph to Sacramento, along with 50 riders and 500 horses. They completed the task in time for the April 3, 1860, opening. Ficklin later clashed with Russell and quit the business in July 1860. He became one of the incorporators of the Pacific Telegraph Company. Pony Express stations were placed at intervals of about 10 miles (16 km) along the route , roughly the maximum distance a horse can travel at full gallop. The rider changed to a fresh horse at each station, taking only the mail pouch (called a mochila, Spanish (from Basque) for "pouch") with him. The Mochila was thrown over the saddle and held in place by the weight of the rider sitting on it. Each corner had a cantina, or pocket. Bundles of mail were placed in these cantinas, which were padlocked for safety. The mochila could hold 20 pounds (10 kg) of mail along with the 20 pounds of material carried on the horse, allowing for a total of 165 pounds (75 kg) on the horse's back. Riders, who could not weigh over 125 pounds, were changed about every 75–100 miles (120-160 km). Included in that 20 pounds were: a water sac, a Bible, a knife, a horn for alerting the relay station master to prepare the next horse, a revolver, and a choice of a rifle or another revolver. Eventually, they took away everything except one revolver and a water sac to cut down on the weight. The riders received $100 per month as pay. Majors had acquired over 400 horses for the project, and these averaged about 14½ hands (1.47 m) high and weighed under 900 pounds (410 kg), thus the name pony was appropriate, even if not strictly correct for all the horses. Pony Express map from National Park Service. The Utah portion of the Pony Express Trail. The route roughly followed the Oregon Trail, Mormon Trail and California Trail. After crossing the Missouri River at St. Joseph to Kansas, it followed what is modern day US 36—the Pony Express Highway—to Marysville, Kansas, where it turned northwest following Little Blue River to Fort Kearney in Nebraska. Through Nebraska it followed the Great Platte River Road, cutting through Gothenburg, Nebraska and passing Courthouse Rock, Chimney Rock, and Scotts Bluff, clipping the edge of Colorado at Julesburg, Colorado, before arriving Fort Laramie in Wyoming. From there it followed the Sweetwater River, passing Independence Rock, Devil's Gate, and Split Rock, to Fort Caspar, through South Pass to Fort Bridger and then down to Salt Lake City. It crossed the Great Basin, the Utah-Nevada Desert, and the Sierra Nevada near Lake Tahoe before arriving in Sacramento. Mail was then sent via steamer down the Sacramento River to San Francisco. On a few instances when the steamer was missed, riders took the mail via horseback to Oakland, California. The rides were scheduled to leave San Francisco and St. Joseph simultaneously on April 3, 1860 although the westbound route has gotten more publicity. No photographs of riders beginning in either direction are known and none are believed to exist. The messenger delivering the mochila from New York and Washington missed a connection in Detroit and arrived in Hannibal, Missouri, two hours late. The railroad cleared the track and dispatched a special locomotive called the "Missouri" with a one-car train to make the 206-mile (332 km) trek across the state in a record 4 hours, 51 minutes — an average of 40 miles per hour (64 km/h). It arrived at Olive and 8th Street — a few blocks from the company's new headquarters in a hotel at Patee House at 12th Street and Pennsylvania and the company's nearby stables on Pennsylvania. The first pouch contained 49 letters, five private telegrams, and some papers for San Francisco and intermediate points. St. Joseph Mayor M. Jeff Thompson, William Russell and Alexander Majors gave speeches before the mochila was handed off. There is debate over who actually was the first rider. The ride began at about 7:15 p.m. The first horse-ridden leg of the Express was only about a half mile (800 m) from the Express stables/railroad area to the Missouri River ferry at the foot of Jules Street. 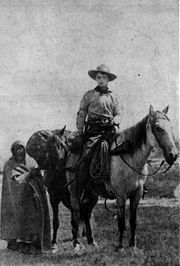 Johnny Fry is credited as the first westbound rider who carried the pouch across the Missouri River ferry to Elwood, Kansas. Reports indicated that horse and rider crossed the river; however, subsequently, the courier crossed the river without a horse, getting the mount at a stable on the other side. However, the identity of the first rider has long been in dispute. The Weekly West (April 4, 1860) reported Johnson William Richardson was the first rider (see Footnote 358 ). James Randall is credited as the first rider from the San Francisco Alta telegraph office since he was on the steamship Antelope to go to Sacramento. At 2:45 a.m., William (Sam) Hamilton was the first rider to begin the journey from Sacramento. The Pony Express had grossed $90,000 and lost $200,000. In 1866, after the American Civil War was over, Holladay sold the Pony Express assets along with the remnants of the Butterfield Stage to Wells Fargo for $1.5 million. Wells Fargo used the Pony Express logo for its guard and armored car service. The logo continued to be used when other companies took over the security business into the 1990s. Effective 2001, the Pony Express logo was no longer used for security businesses since the business has been sold. 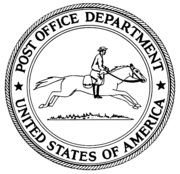 In June 2006, the United States Postal Service announced it had trademarked "Pony Express" along with Air Mail. Pony Express statues are in Sacramento; Stateline, Nevada; Reno, Nevada; Salt Lake City; Casper, Wyoming; Julesburg, Colorado; Marysville, Kansas; North Kansas City, Missouri; and St. Joseph. The original and most famous is the one dedicated on April 20, 1940, in St. Joseph. It was sculpted by Hermon Atkins MacNeil. It is at City Hall Park. The city has rejected proposals to move it to the park opposite the stables. McGraw Hill and AMERIKIDS USA produced the educational game PONY EXPRESS RIDER in 1996 to teach the value of the Pony Express in helping the Union win the Civil War. The Pony Express helped the Union uncover the plans of the Knights of the Golden Circle.